Extensions, Conservatories and Orangeries are popular ways to raise the profile of your property, but if you are considering one of these additions, do you know what you want? Are you clear about what sets them apart from each other? It seems that many people are not sure what the differences are between these three types of home improvement, but knowing the variations and what you would prefer is the best way to help with your decision, and deliver a satisfactory outcome. Start by thinking about what you need from your new space, how it will be used, and who will get the most benefit. Your choice will depend on a number of factors, and a better understanding of these structures will help you to decide. Home extensions are a great way to open up the home, and provide a larger, more functional environment. The kitchen is often the site of an extension, and a newly designed kitchen layout is an exciting prospect for sure. This type of extension can be large, small or even multi storey, and is usually designed in keeping with the existing building. Planning permission must be sought from the local authority when contemplating an extension also. These structures differ from extensions in that they consist of more glazing and frames, and they are generally added on to a property. This means that an external door will be present connecting the house and conservatory. 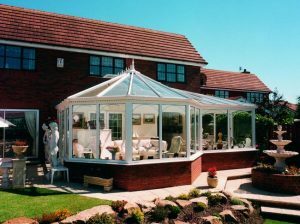 Over the years conservatories have evolved into exceptionally versatile spaces, using a wide range of modern materials and innovative lightweight roofs. The orangery tends to feature a larger amount of brickwork than the conservatory, appearing more extension like at a lesser cost. They can retain heat in the winter and open up the home to the garden in summertime. Think about the ultimate function of your new home improvement which will then inform your choice. Modern constructions are a far cry from the home additions of yesteryear, with state of the art security features and exceptional thermal efficiency capabilities. Not only highly attractive but adding outstanding value and desirability to your home!